Does your office, store, or workplace have a lot of goods that need to be transported between areas? Our wire utility carts are the best mobile solution for moving items, tools, and inventory all around your business. 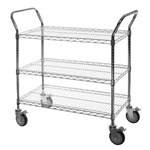 Perfect for internal mail and deliveries, transporting linens, or even delivering food thanks to the NSF-approved shelving we use. These carts are easy to handle to fit down any corridor or doorway you might encounter, and we offer donut bumpers to protect your walls in case of any accidents. The wire bins are perfect for smaller parts, and the security cages can keep any of your more sensitive & valuable items safe from prying eyes and environmental accidents. Interested to see what wire utility carts can do for you? Request a free quote today!